One of the most common issues that we deal with in Edinburgh. Damp issues and causes are often misdiagnosed or incorrectly repaired. Traditionally-built buildings can be prone to damp issues if not correctly maintained. The key to correct diagnosis is understanding the building’s construction. For example, traditionally-built buildings rely on the unrestricted movement of moisture. The use of modern building materials and treatments such as cement can restrict this movement of moisture, creating a build-up of excess moisture in the substrate leading to damp issues. If a damp problem is to be properly fixed it is important that the source of the problem is properly identified. Affected areas need to be allowed to dry out completely before any remedial work is undertaken. If the source of ingress leading to increased moisture is not treated, or the problem is incorrectly diagnosed, the original problem will continue to develop, with unnecessary or incorrect repair work causing added problems and further unnecessary costs. In some instances, it may not be possible to overcome climatic or site conditions. This is particularly common on sub-surface walls such as basements etc. We would need to accept the presence of moisture in these walls and look at alternate remedial methods to eliminate internal moisture (such as the construction of an internal partitioning with vapour barriers). Most damp problems arise through the material failure of the building’s detailing or inappropriate interventions where work has been carried out with the wrong material; the use of cement where a lime based mortar had been used previously is a good example of this. If a new problem emerges there will be a need to carefully consider any work that might have been recently carried out which could have initiated. Where regular inspection of roofs is not carried out, a small leak from a dislodged slate, tile or lead flashing, or cracked gutter, can remain undetected for some time. This can lead to an increasing build-up of moisture in walls, timber and plaster. Unless the problem is particularly acute this will rarely escalate into creating actual drips, but it will create excellent conditions for rot to flourish leading to progressive decay of structural timber and decorative finishes. The correct functioning of all forms of rainwater goods both guttering and downpipes are vital. Failure in a single element can allow large volumes of water to pour into walls, this continual soaking of the walls allows moisture to penetrate further into the stonework. Due to Edinburgh’s climate, these walls can have large volumes of water cascading over them on a weekly basis, not allowing the walls to fully dry out. Identifying such failure is most visible during or just after rainfall where these soaked sections are visible. As a result of this, a consistently high moisture content can have associated problems. Timbers that come in direct contact with the stonework can be particularly vulnerable, the saturated stonework creating ideal conditions for wet and dry rot to establish. As the timber decays attacks from beetles and other insects become more likely. When repairs are carried out, care should always be taken to use correct traditional building materials as modern alternatives are not always suitable. Their inappropriate use often has an adverse effect by inhibiting moisture movement. 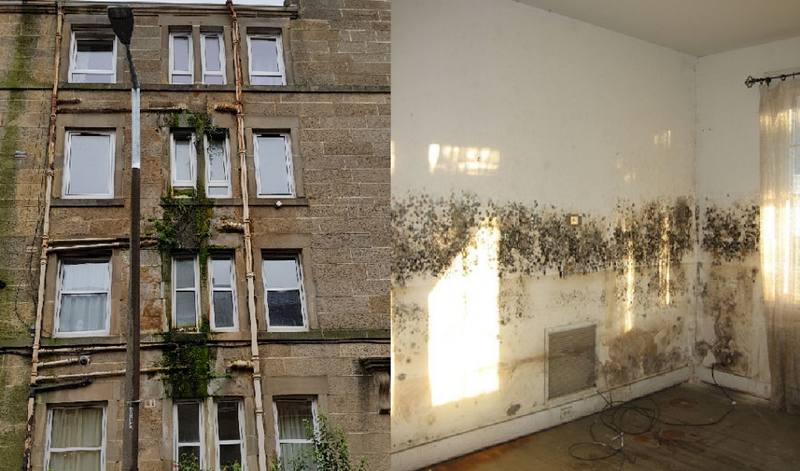 Poor quality work can also create or contribute to damp problems. Such as water penetration through walls and chimneys, occurring as a result of poor re-pointing, or through inadequately installed lead coverings at roof junctions, particularly on exposed elevations. The situation is often made worse using non-porous surface coatings such as cement render and masonry paint. Any moisture that is absorbed through coating failures such as cracks, inadequate coating coverage or poor workmanship. This moisture is held within the walls, as the coating prevents the moisture from evaporation. This allows the moisture to be drawn into the stonework further through capillary action. With the evaporation taking place internally. This is not only unsightly with the associated health risks large-scale saturation of walls leads to reduced thermal performance increased heating bills. The current need for greater energy efficiency has led to an increase in the application of different forms of insulation. In addition to installing sealed windows, this is often linked to closing off traditional ventilation grilles and restricting airflow within the structure, resulting in stagnant humid air building up within enclosed spaces. Blocked chimneys, enclosed underfloor voids, and airspaces behind skirtings and panelling, all contributing to poor ventilation. Creating a range of conditions suitable for a number of decay mechanisms to set in. Wood beetle infestation, dry rot and wet rot outbreaks can all occur as a result of the increased moisture levels. External air circulation is equally as important outside. Large shrubs and overhanging trees close to walls can raise the humidity levels considerably. This can then be progressively absorbed by any adjacent structure. This is not to mention the damage to mortar and drainage systems shrubs such as Ivy do.